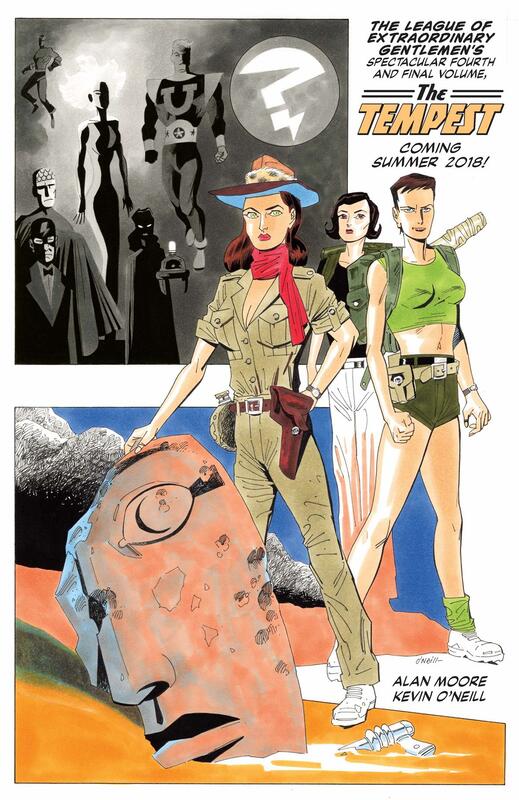 At Comic-Con International, Top Shelf Comix and Knockabout announced the final edition of Alan Moore and Kevin O’Neill’s League of Extraordinary Gentlemen epic. The last chapter featuring their crazy, cross-continuity adventures will be titled, appropriately, The Tempest. Per Top Shelf, it will also conclude both gentleman’s comics careers. After an epic seventeen-year journey through the entirety of human culture – the biggest cross-continuity ‘universe’ that is conceivable – Alan Moore and Kevin O’Neill will conclude both their legendary League of Extraordinary Gentlemen and their equally legendary comic-book careers with the series’ spectacular fourth and final volume, The Tempest. Tying up the slenderest of plot threads and allusions from the three preceding volumes, The Black Dossier, and the Nemo trilogy into a dazzling and ingenious bow, the world’s most accomplished and bad-tempered artist-writer team will use their most stylistically adventurous outing yet to display the glories of the medium they are leaving; to demonstrate the excitement that attracted them to the field in the first place; and to analyse, critically and entertainingly, the reasons for their departure. So it may get a little bit meta. Considering the careers they’ve had, that should be interesting, to say the least. Opening simultaneously in the panic-stricken headquarters of British Military Intelligence, the fabled Ayesha’s lost African city of Kor and the domed citadel of ‘We’ on the devastated Earth of the year 2996, the dense and yet furiously-paced narrative hurtles like an express locomotive across the fictional globe from Lincoln Island to modern America to the Blazing World; from the Jacobean antiquity of Prospero’s Men to the superhero-inundated pastures of the present to the unimaginable reaches of a shimmering science-fiction future. With a cast-list that includes many of the most iconic figures from literature and pop culture, and a tempo that conveys the terrible momentum of inevitable events, this is literally and literarily the story to end all stories. Commencing as a six-issue run of unfashionable, outmoded and flimsy children’s comics that will make you appear emotionally backward if you read them on the bus, this climactic magnum opus will also reprint classic English super-team publication The Seven Stars from the murky black-and-white reaches of 1964. A magnificent celebration of everything comics were, are and could be, any appreciator or student of the medium would be unwise to miss The League of Extraordinary Gentlemen, Volume IV: THE TEMPEST. League started life as two six-issue miniseries, which were followed by a hardcover graphic novel called The Black Dossier. It featured the team-up for the ages, as Captain Nemo, Allan Quatermain, Dr. Jekyll, Mina Murray and Hawley Griffin the Invisible Man took on the likes of Fu Manchu, Professor Moriarty and a War of the Worlds style Martian invasion. Originally published by Wildstorm before their acquisition by DC Comics, Moore was reluctant to work with DC after they bought Jim Lee’s company, but they managed to publish everything up through the Black Dossier before Moore and O’Neill pulled the property. Top Shelf and Knockabout published three volumes of a spinoff starring Nemo’s daughter, Janni Dakkar, as well as reprints of the previous volumes. The six-issue mini-series is due out in June 2018 from Top Shelf in the U.S. and Knockabout in the UK.